Letters and Papers, Foreign and Domestic, Henry VIII, Volume 18 Part 2, August-December 1543. Originally published by His Majesty's Stationery Office, London, 1902. Naas, in Ireland, I. 553 (2). Nagera or Nagers. See Najera. -, II. 177, 345, 380. Nalson, Humph., I. g. 346 (66). Namur, in the Netherlands, I. 144. Nanseglos, John, I. g. 623 (33). Nantes, in France, I. 900. Naper, John, I. g. 981 (57, 77). -, II. 290, 338, 376. -, vice-roy of. See Toledo, Pedro de. Napoli, Cesare de, in the Emperor's service in Piedmont, I. 29 (p. 19). Nappa (Nappay), Yorks., I. 175. Napper, Mr., II. 546 (p. 351). Narberth (Narbarte), co. Pemb., I. g. 476 (9). Narbonne (Narbona), in France, I. 29 (p. 19), 106 (p. 73), 231 (p. 136). -, II. 408, 525 (3), 526, 528. See also under Ships, King's fleet in the Narrow Seas. Naseby (Navesby), Ntht., II. g. 449 (65). Nashe (Nasshe), Alice, I. p. 548. -, David, I. 436 (f. 61). - (Nasshe), John, I. p. 548. - (Nasshe), Robt., I. 436 (f. 79). Nasing Wood, Essex, II. 231 (p. 128). Nassau, Count William of. II. 126. Nassington, Ntht., II. g. 449 (1). Nateler, Lanc., II. g. 107 (1). Naunton, Glouc., II. g. 107 (8, 56vi.). Navan, in Ireland, I. 411. Navarre, Kingdom Of, I. 69, 471. - viceroy of, I. 471. Navarre, marriage of. See Albret, Jeanne, d'. Navarre, Henri d'Albret King of, an exile in France, I. 217 (p. 118). Navenby (Naveby), Linc., I. p. 546. Naves (Navus), Dr. John, vice-chancellor of the Empire, II. 25, 457. Navisford (Navesforde) hundred, Ntht., I. p. 545. Naworth (Naward), Cumb., I. 799. Naylor (Neylour, Nayler), Robt., II. 546 (pp. 321, 324). Neasham (Neseham), Dham., I. g. 802 (66). -, priory (supp. ), I. g. 802 (66). Neath (Nethe, Neth), co. Glamorgan, abbey (supp. ), I. 436 (f. 59) :g. 981 (54). Necton (Neyton), Norf., II. g. 449 (4). Nedeham (Nedam), Avicia, II. g. 327 (7). -, II. 231 (p. 128 bis) :g. 327 (7). - (Nedham), John, II. g. 327 (7). Nedertzier, in Juliers, II. 126. Needles, the, I. 91 (p. 61). Negropont, in Greece, I. 642. Neigerez, duke of. See Najera. -, II. 231 (p. 127). Nerber, Isabella, I. p. 558. -, Mich., I. p. 558. Neretti, Marotte or Mariotto, a Florentine, I. 208, 847. Neson, Ant., I. p. 551. Neth or Nethe. See Neath. Netherexe (Nethereux), Devon, I. p. 557. Nethermyll, John, I. 436 (f. 73). -, Julyne, I. 436 (f. 73). Nethersall, Robt., II. 231 (p. 121). Netherthroughmaston, Derb., I. g. 226 (2). Netley Abbey (supp. ), Hants., II. g. 241 (31). Nettleton (Nettilton), Linc., II. g. 327 (17). Neue. Robt., I. g. 346 (20). Neuss, conferences at, II. 183. Neuvilly (Novely, Neuveley), in Cambray, letters dated at, II. 336-7. Nevel or Nevell. See Neville. Nevetson, Ric., I. g. 981 (26, 34). Nevez (Nevet), Mons. de, a Breton landowner I. 91 (3, 4). Neville (Nevel), Henry Lord, son of the earl of Westmoreland, I. 19. Neville or Nevill, Mr., II. 546 (pp. 301, 303). - (Nevell), Andrew, II. 231 (p. 120). - (Nevell), Ant., I. 442 :g. 226 (9, 48), 802 (77). -, Chr., I. g. 802 (61). - (Nevell), Sir Edward, uncle to Lord Montague (executed 9 Dec. 1538), I. 66 (32). - (Nevell), Edward, son of Sir Edward, restored in blood, I. 66 (32). -, Geo., I. g. 226 (61). - (Nevell), John, lord Latimer, q.v. -, Sir John, I. g. 623 (100). -, John, I. g. 226 (61). - (Nevell), Mary, I. 436 (f. 3). - (Nevell), Robt., S.T.P., prb. of Canterbury, II. g. 449 (37). - (Nevell), Robt., I. g. 226 (48). - (Nevyle), Sir Thos., I. 436 (f. 75). -, -, Lady Elizabeth, his wife, I. 436 (f. 75). -, II. 231 (p. 121). Nevinson or Nevenson, Chr., Cranmer's commissary, II. 546 (pp. 291, 294, 298-9, 303, 307, 309-11, 313-14, 317, 319, 330, 334-5, 356, 358-9, 362-4, 366-7). -, -, his wife, II. 546 (p. 330). Newark, Notts, I. p. 550. -, Austin Friars (supp. ), I. g. 981 (56). -, II. g. 107 (26, 44, 49), 449 (63). Newarkes Norton, Essex, I. g. 226 (79, 87). Newbattell abbey, in Scotland, I. 26 (3). Newbiggin, Cumb., I. g. 802 (51). -, II. g. 449 (17). Newboo, in Barrowby, Linc., II. g. 449 (44). -, abbey (supp. ), II. g. 327 (17), 449 (44). Newbottle (Newbotell), Ntht., II. g. 529 (10, 30). -, II. 231 (p. 123). Newbury, Berks, II. g. 529 (29). -, Chepstrete, II. g. 529 (29). -, Northebrekestrete, II. g. 529 (29). Newby, Westmld., I. g. 981 (26, 34). Newby, Yorks., I. g. 226 (66). -, II. 6, 9, 42, 58, 119, 121, 184, 195 (2), 231 (p. 121), 234, 281, 287, 370 (p. 205), 408 :g. 449 (42). -, II. 36, 63, 71, 90, 307, 382, 511. -, comptroller of, II. g. 449 (42). 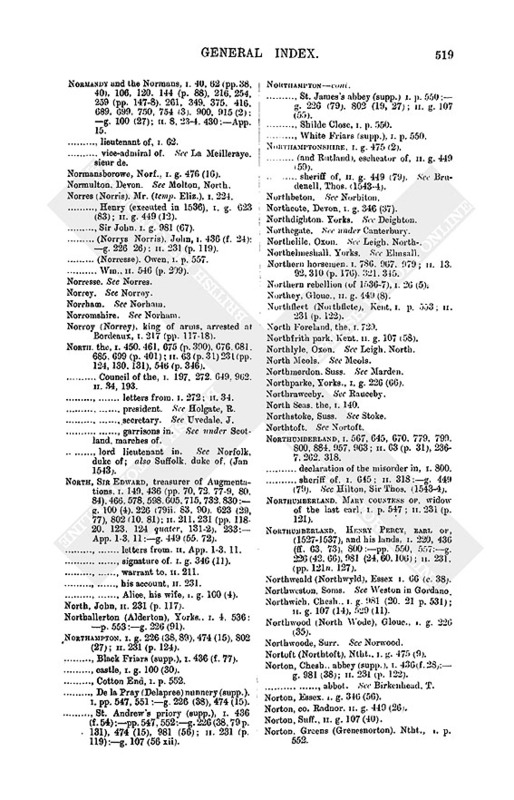 -, comptrollerships of customs, I. g. 226 (88). -, II. 11, 318, 408. Newchurch, Kent, I. p. 554. Newdigate (Newdegate), Ant., I. g. 226 (41). - (Nudygate, Nedygate), Dunstan captain of a ship. I. 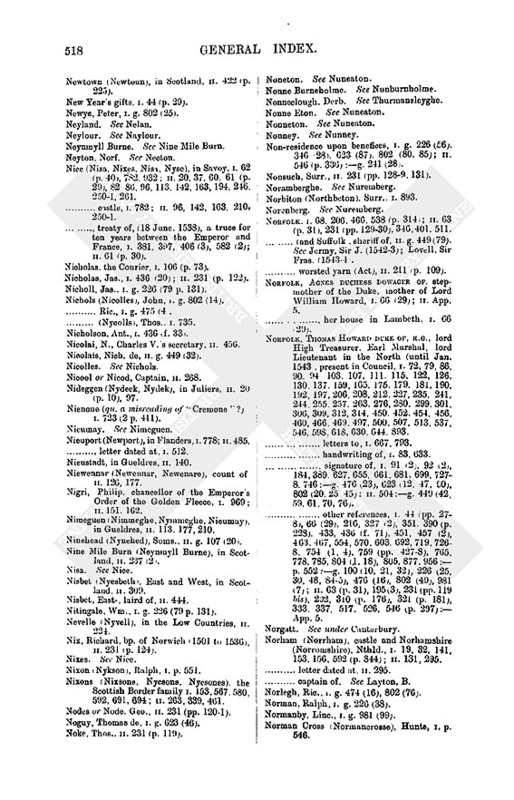 200, 225, 434, 596, 765 (p. 431) :p. 549. - (Nudegate), John I. g. 100 (21), 623 (23). Newell, Alice, II. g. 241 (11). -, John, II. g. 241 (11). -, Nic., II. g. 241 (11). - Wm., II. g. 241 (11). Newenare, earl of. See Niewennar. -, II. 231 (p. 120). New Forest, Hants, I. g. 226 (75). Newhall (Newehall), Essex. See Beaulieu. Newhall, Yorks., I. g. 100, 33, 802 (71). Newhall manor, Herts., I. g. 981 (20, 21, 56, 64). Newham or Newenham (Newneham) abbey (supp. ), Devon, near Axminster I. 436 (ff. 50, 74). Newham, Sir Wm. See Newenham. New Haven. See Havre de Grace. Newhey, Yorks., II. g. 107 (67). Newington, Kent, II. g. 107 (36). Newington by Sittingbourne, Kent, II. 546 (p. 311). -, vicar of. 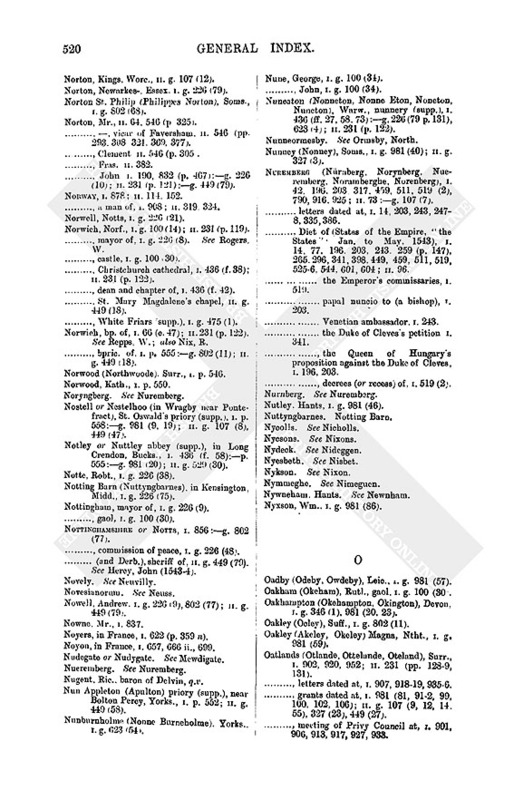 See Howe, R.
Newington, South- (Southnewenton), Oxon, I. p. 553. Newington, Robt., II. 546 (p. 307). Newland, Glouc., I. g. 226 (35). -, II. g. 107 (1). Newland near Coventry, I. p. 550. New Learning, the, I. 64. Newman, , II. 546 (p. 293). Newnam or Newname, Jas., priest, II. 546 (pp. 302, 313). Newnham (Newenham), Glouc. I. g. 226 (35). Newnham (Nywneham), Hants., I. g. 802 (69). Newnham (Newneham), Herts., I. g. 981 (95). Newnney field, Herts., II. g. 449, 78). Newport, Devon II. g. 241 (8). Newport, in Flanders. See Nieuport. -, II. g. 107 (43). -, Black Friars or Friars Preachers (supp. ), II. g. 107 (43). Newport, Salop, I. p. 558 :g. 981 (53). Newport Pagnel (N. Pannell), Bucks, I. g. 802 (37). Newport or N. Pond, Essex, I. p. 549. -, St. Leonard's hospital (supp. ), I. p. 548-9. -, II. g. 107 (56ix). Newry, in Ireland, I. 245. Newse, Clement, I. g. 346 (66). Newsham (Newsome) abbey, (supp. ), in Brocklesby, Linc., II. g. 327 (17), 449 (58). Newstead (Newested), Yorks., I. g. 226 (66). -, II. g. 327 (17). Newstead priory (supp. ), in Sherwood Forest. Notts I. g. 981 (14). Newthorpe, Notts, (near Beauvale? ), II. 231 (p. 125). Newton, co. Glam., I. g. 474 (11). Newton, Norf., I. g. 476 (16). Newton, Suff., near Sudbury, II. g. 241 (10). Newton, Yorks., I. p. 555. Newton, Kirk-, Nthld., II. 538. Newton Stacy, Wilts., I. g. 226 (79 p. 131). Newton, West., Nthld., II. 538. Newton-le-Willows. Yorks., II. g. 107 (18). Newton, Wood- (Woodnewton), Ntht., II. g. 449 (1). Newton, Hugh, I. g. 981 (77). - Sir John, I. g. 100 (32). - John, I. g. 981 (68). Newtown (Newtoun), in Scotland, II. 422 (p. 225). New Year's gifts, I. 44 (p. 29). Newys, Peter, I. g. 802 (25). Neynmyll Burne. See Nine Mile Burn. -, II. 20, 37, 60, 61 (p. 29), 82, 86, 96, 113, 142, 163, 194, 246, 250-1, 261. -, II. 96, 142, 163, 210, 250-1. -, II. 61 (p. 30). Nicholas, the Courier, I. 106 (p. 73). -, II. 231 (p. 122). Nicholl, Jas., I. g. 226 (79 p. 131). Nichols (Nicolles), John, I. g. 802 (14). - Ric., I. g. 475 (4). - (Nycolls), Thos., I. 735. Nicholson, Ant., I. 436 (f. 33). Nicolai, N., Charles V.'s secretary, II. 456. Nicolais, Nich. de, II. g. 449 (32). Nicool or Nicod, Captain, II. 268. Nideggen (Nydeck, Nydek), in Juliers, II. 20 (p. 10), 97. Nienoue (qu. a misreading of "Cremone"?) I. 723 (2 p. 411). -, letter dated at, I. 512. Nieustadt, in Gueldres, II. 140. Niewennar (Newennar, Newenare), count of II. 126, 177. Nimeguen (Nimmeghe, Nymmeghe, Nieumay), in Gueldres, II. 113, 177, 210. Ninehead (Nynehed), Soms., II. g. 107 (20). Nine Mile Burn (Neynmyll Burne), in Scotland, II. 237 (2). Nisbet (Nyesbeth), East and West, in Scotland, II. 309. 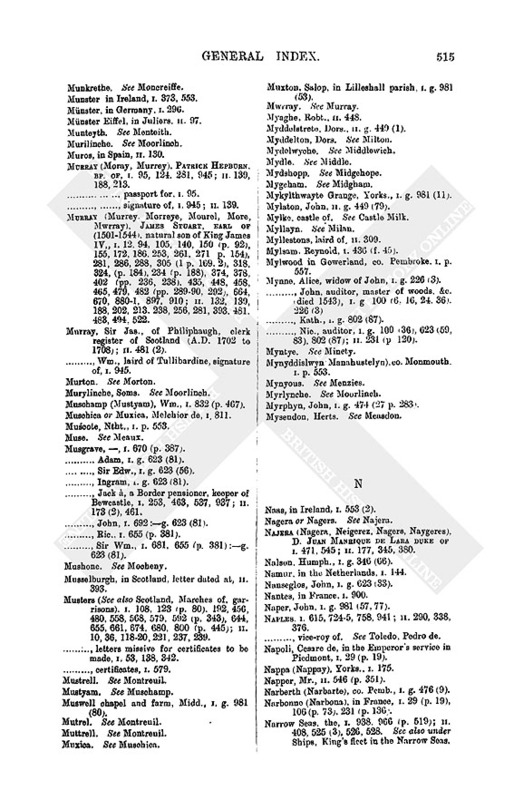 Nisbet, East-, laird of, II. 444. Nitingale, Wm., I. g. 226 (79 p. 131). Nevelle (Nyvell), in the Low Countries, II. 224. Nix, Richard, bp. of Norwich (1501 to 1536), II. 231 (p. 124). Nixon (Nykson), Ralph, I. p. 551. -, II. 263, 339, 461. Nodes or Node, Geo., II. 231 (pp. 120-1). Noguy, Thomas de, I. g. 623 (46). Noke, Thos., II. 231 (p. 119). -, II. 546 (p. 336) :g. 241 (28). Nonsuch, Surr., II. 231 (pp. 128-9, 131). 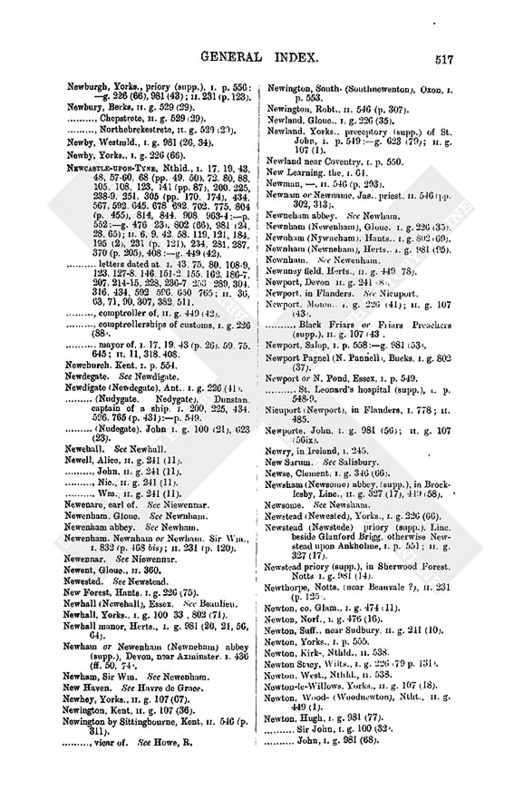 Norbiton (Northbeton), Surr., I. 893. -, II. 63 (p. 31), 231 (pp. 129-30), 346, 401, 511. -, Lovell, Sir Fras. (1543-4). -, worsted yarn (Act), II. 211 (p. 109). -, -, her house in Lambeth, I. 66 (29). Norfolk, Thomas Howard Duke of, K.G., lord High Treasurer. Earl Marshal, lord Lieutenant in the North (until Jan. 1543, present in Council, I. 72, 79, 86, 90, 94, 103, 107, 111, 115, 122, 126, 130, 137, 159, 165, 175, 179, 181, 190, 192, 197, 206, 208, 212, 227, 235, 241, 244, 255, 257, 263, 276, 280, 299, 301, 306, 309, 312, 314, 450, 452, 454, 456, 460, 466, 469, 497, 500, 507, 513, 537, 546, 598, 618, 630, 644, 893. -, -, letters to, I. 667, 793. -, -, handwriting of, I. 83, 633. -, -, signature of, I. 91 (2), 92 (2), 184, 389, 627, 655, 661, 681, 699, 727-8, 746 :g. 476 (23), 623 (12, 47, 90), 802 (20, 25, 45) : II. 504 :g. 449 (42, 59, 61, 70, 76). -, II. 63 (p. 31), 195 (3), 231 (pp. 119 bis), 292, 310 (p. 176), 321 (p. 181), 333, 337, 517, 526, 546 (p. 297) : App. 5. - letter dated at, II. 295. - captain of. See Layton, B.
Norlegh, Ric., I. g. 474 (16), 802 (76). Norman, Ralph, I. g. 226 (38). Normanby, Linc., I. g. 981 (99). Norman Cross (Normancrosse), Hunts, I. p. 546. -, II. 8, 23-4, 430 :App. 15. -, lieutenant of, I. 62. -, vice-admiral of. See La Meilleraye, sieur de. Normansborowe, Norf., I. g. 476 (16). Normulton, Devon. See Molton, North. Norres (Norris), Mr. (temp. Eliz. ), I. 224. -, II. g. 449 (12). -, Sir John. I. g. 981 (67). - (Norrys Norris), John, I. 436 (f. 24) : g. 226 26) : II. 231 (p. 119). - (Norresse). Owen, I. p. 557. - Wm., II. 546 (p. 299). Norroy (Norrey), king of arms, arrested at Bordeaux, I. 217 (pp. 117-18). -, II. 63 (p. 31) 231 (pp. 124, 130, 131), 546 (p. 346). -, Council of the, I. 197, 272, 649, 962, II. 34, 193. -, -, president. See Holgate, R.
-, -, secretary. See Uvedale, J. -, -, garrisons in. See under Scotland, marches of. -, also Suffolk, duke of, (Jan 1543). -, II. 211, 231 (pp. 118-20, 123, 124 quater, 131-2), 233 : App. 1-3, 11 :g. 449 (55, 72). -, -, letters from. II. App. 1-3, 11. -, -, signature of. I. g. 346 (11). -, -, warrant to, II. 211. -, -, his account, II. 231. -, -, Alice, his wife, I. g. 100 (4). North, John, II. 231 (p. 117). Northallerton (Alderton), Yorks., I. 4, 536 : p. 553 :g. 226 (91). -, II. 231 (p. 124). -, Black Friars (supp. ), I. 436 (f. 77). -, castle, I. g. 100 (30). -, Cotton End, I. p. 552. -, De la Pray (Delapree) nunnery (supp. ), I. pp. 547, 551 :g. 226 (38), 474 (15). -, II. 231 (p. 119) :g. 107 (56 xii). -, II. g. 107 (55). -, Shilde Closc, I. p. 550. -, White Friars (supp. ), I. p. 550. Northamptonshire, I. g. 475 (2). - (and Rutland), escheator of, II. g. 449 (59). -, sheriff of, II. g. 449 (79). See Brudenell, Thos. (1543-4). Northcote, Devon, I. g. 346 (37). Northelile, Oxon. See Leigh, North-. -, II. 13. 92, 310 (p. 176), 321, 345. Northern rebellion (of 1536-7), I. 26 (5). Northey, Glouc., II. g. 449 (8). North Foreland, the, I. 729. Northfrith park, Kent. II. g. 107 (58). Northlyle, Oxon. See Leigh, North. Northparke, Yorks., I, g. 226 (66). North Seas, the, I. 140. -, II. 63 (p. 31), 236-7, 262, 318. -, declaration of the misorder in, I. 800. -, II. 318 :g. 449 (79). See Hilton, Sir Thos. (1543-4). -, II. 231, (pp. 121n. 127). Northweald (Northwyld), Essex I. 66 (c. 38). Northweston, Soms. See Weston in Gordano. -, II. g. 107 (14), 529 (11). Northwood (North Wode), Glouc., I. g. 226 (35). Nortoft (Northtoft), Ntht., I. g. 475 (9). -, -, abbot. See Birkenhead, T.
Norton, Essex. I. g. 346 (56). Norton, co. Radnor, II. g. 449 (26). Norton, Suff., II. g. 107 (40). 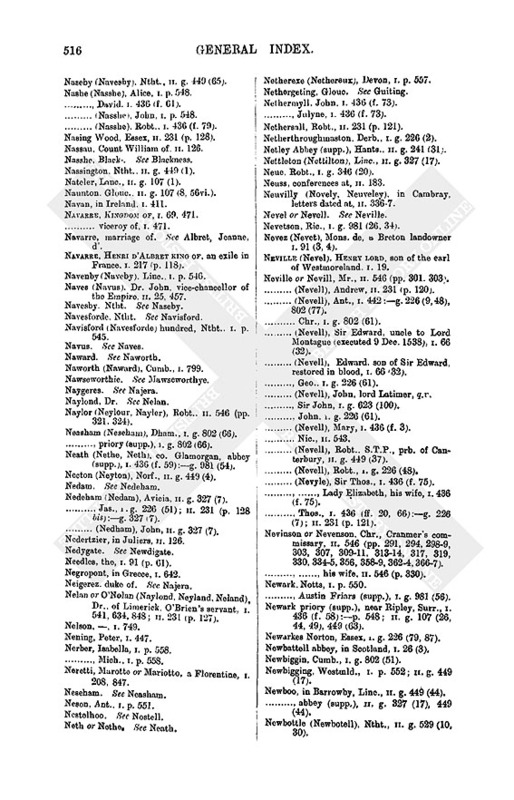 Norton, Greens (Grenesnorton), Ntht., I. p. 552. Norton, Kings, Worc., II. g. 107 (12). Norton, Newarkes-, Essex. I. g. 226 (79). Norton St. Philip (Philippes Norton), Soms., I. g. 802 (68). Norton, Mr., II. 64, 546 (p 325). - , vicar of Faversham, II. 546 (pp. 293, 308, 321, 369, 377). -, Clement II. 546 (p. 305). -, II. 231 (p. 121) :g. 449 (79). Norwell, Notts, I. g. 226 (21). -, II. 231 (p. 119). -, mayor of, I. g. 226 (8). See Rogers, W.
-, dean and chapter of, I. 436 (f. 42). - St. Mary Magdalene's chapel, II. g. 449 (18). -, White Friars supp. ), I. g. 475 (1). -, II. 231 (p. 122), See Repps, W.
-, II. g. 449 (18). Norwood (Northwoode), Surr., I. p. 546. Norwood, Kath., I. p. 550. -, II. g. 107 (8), 449 (47). -, II. g. 529 (30). Notte, Robt., I. g. 226 (38). Notting Barn (Nuttyngbarnes), in Kensington, Midd., I. g. 226 (75). Nottingham, mayor of, I. g. 226 (9). -, gaol, I. g. 100 (30). Nottinghamshire or Notts, I. 856 :g. 802 (77). -, commission of peace, I. g. 226 (48). - (and Derb. ), sheriff of, II. g. 449 (79). See Hercy, John (1543-4). -, II. g. 449 (79). Noyers, in France, I. 622 (p. 359 n). Noyon, in France, I. 657, 666 ii., 699. Nudegate or Nudygate. See Mewdigate. Nugent, Ric., baron of Delvin, q.v. -, II. g. 449 (58). Nunburnholme (Nonne Burneholme), Yorks., I. g. 623 (54). Nune, George, I. g. 100 (34). -, John, I. g. 100 (34). -, II. g. 327 (3). -, II. 73 :g. 107 (7). - letters dated at, I. 14, 203, 243, 247-8, 335, 386. - - the Emperor's commissaries, I. 519. - - papal nuncio to (a bishop), I. 203. - - Venetian ambassador, I. 243. - - the Duke of Cleves's petition I. 341. - -, the Queen of Hungary's proposition against the Duke of Cleves, I. 196, 203. - -, decrees (or recess) of, I. 519 (2). Nutley, Hants, I. g. 981 (46). Nyxson, Wm., I. g. 981 (86).